FAO species identification guide for fishery purposes. 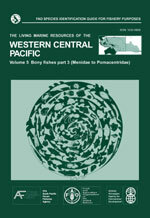 The living marine resources of the Western Central Pacific. Volume 6. Bony fishes part 4 (Labridae to Latimeriidae), estuarine crocodiles, sea turtles, sea snakes and marine mammals. Rome, FAO. 2001. pp. 3381-4218. This multivolume field guide covers the species of interest to fisheries of the major marine resource groups exploited in the Western Central Pacific. The area of coverage includes FAO Fishing Area 71 and the southwestern portion of Fishing Area 77 corresponding to the South Pacific Commission mandate area. The marine resource groups included are seaweeds, corals, bivalves, gastropods, cephalopods, stomatopods, shrimps, lobsters, crabs, holothurians, sharks, batoid fishes, chimaeras, bony fishes, estuarine crocodiles, sea turtles, sea snakes, and marine mammals. The introductory chapter outlines the environmental, ecological, and biogeographical factors influencing the marine biota, and the basic components of the fisheries in the Western Central Pacific. Within the field guide, the sections on the resource groups are arranged phylogenetically according to higher taxonomic levels such as class, order, and family. Each resource group is introduced by general remarks on the group, an illustrated section on technical terms and measurements, and a key or guide to orders or families. Each family generally has an account summarizing family diagnostic characters, biological and fisheries information, notes on similar families occurring in the area, a key to species, a checklist of species, and a short list of relevant literature. Families that are less important to fisheries include an abbreviated family account and no detailed species information. Species in the important families are treated in detail (arranged alphabetically by genus and species) and include the species name, frequent synonyms and names of similar species, an illustration, FAO common name(s), diagnostic characters, biology and fisheries information, notes on geographical distribution, and a distribution map. For less important species, abbreviated accounts are used. Generally, this includes the species name, FAO common name(s), an illustration, a distribution map, and notes on biology, fisheries, and distribution. Each volume concludes with its own index of scientific and common names.